Moving to San Francisco | Cummings Moving Co.
For those moving to San Francisco – Congratulations! You are in for a once in a lifetime experience. Our city is unlike any other. There is so much to do, to see and SO much to eat! 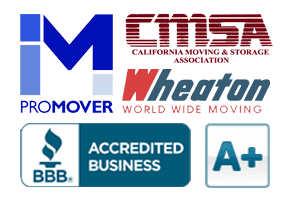 From all of us here at Cummings Moving Company, we’re excited that you are on your way and thought we would share some VERY PRACTICAL information – Things we’d tell a friend moving to San Francisco. Much of the time it’s easier to walk! July and August are often COLD! Parking is tricky – Read ALL the signs! Traffic and parking are a bit nutty here! – So walking is both a great option for the gluts and good for your wallet – No chance of a parking ticket! When moving to San Francisco, get to know the city on foot or by bike! September and October are Beautiful in San Francisco! – Those moving to San Francisco at that time are in for a real treat! Be prepared for gorgeous weather and seeing our city at it’s best during those months. Plan to do tons of outdoor activities and make sure to ask the locals about things to do that are OFF the beaten path, because the tourists also know about the ideal weather and they will be here too! Moving to San Francisco? It’s Colder Than You Think! – For those who have been to San Francisco in August, you know what we mean about the cold! Folks moving to San Francisco rarely believe us when we tell them it’s downright nippy here, but it is! Oh, and the nights… They’re not warm either! Folks moving to San Francisco from the Mid West or East Coast are SO surprised when they arrive during THEIR summer months! Trust us and keep those heavy sweatshirts and socks handy! Coming with Your Car? – Check, double check and triple check the signs! It can be very confusing. Check with your neighbors and make no assumptions. Parking, like housing is at a premium! Consider letting go of your car in lieu of a car-share program though a place like Zip Car! And if you park on a hill, you MUST curb your wheels! It’s a real safety hazard and the city will ticket you. At the end of the page there is a short guide for those moving to San Francisco on How to Curb Your Wheels. Pedestrians Need to Pay Attention! – By all means get out and ENJOY this amazing city, while you are at it, however, please take extra care as you walk around. Drivers have so much in their visual field. Not to mention the drivers who text and drive, tourists in rental cars who are unfamiliar with the area , narrow roads and people everywhere. It is easy to see how being a pedestrian in San Francisco is a defensive activity. And remember, just because you are in a cross-walk does not mean you are safe. Keep your eyes up and look around at ALL times! 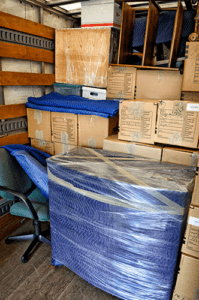 Our blog, Moving Boxes, is a wealth of information. We add new content every couple weeks and have amassed quite the store-house of knowledge to help our clients and those determined to do it themselves. Remember, if you would like a Free Moving Quote, we would love for you to be in touch! We have plenty of posts with moving tips for those moving to San Francisco and the Bay Area in general. These are tips that will come in handy before, during and after your move. Enjoy the Adventure! Visit the California Department of Motor Vehicles for complete information on parking on a hill. And thank you for the Department of Motor Vehicles for this excerpt from their website. Park safely! PHOTO CREDIT – Cummings Moving Company would like to say thank you to Miranda Giuliana. 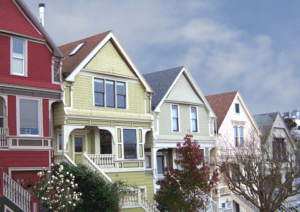 She took this striking pic of these beautiful Painted Ladies – Victorian Houses – San Francisco II.